Pollini is presenting its new and fabulous collection fall winter 2012-2013, a line made as always by creative director Nicholas Kirkwood, which in itself is a guarantee of originality and eccentricity. The designer, in addition to the brand that bears his name, for several years has been building fabulous collections for the brand Pollini, as we have seen recently with the wonderful collection Resort 2013, we discover today with the new line dedicated to the coming winter. Apparently, one of the reasons inspiring the autumn winter 2012-2013 Pollini is the plexiglass, material heavily exploited in recent years by different designers and different fields of fashion. 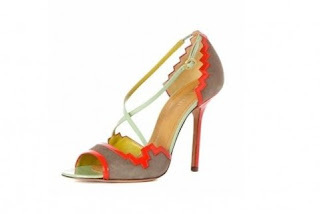 Nicholas Kirkwood thinks her heels in this transparent material and the result is truly unique. The new line offers the most classic decolletes a narrow point with stiletto heel up, one of the models back in fashion this year and now considered classics that every shoe addicts can not do without. In these more classic Italian brand with models then alternates plateau sculpture trademark of Creative Director. The decolletes are designed more often in paint, pastel colors such as orange, or variations in color block heel with plateau and characterized by different patterns than the upper. The models cap-toe players back for the winter season, and in this case we speak of decolletes in bicolor with contrasting patent leather toe and heel in plexiglass to make the shape even more eccentric, while the plateau sculpture featuring ankle boots and booties really singular. Pollini offers models with strings, wide wooden heel and platform that replaces the corrugated tank, or variations in black leather with ankle strap and covered in fur as singular. Also in this field there are the tips for narrow boots the most intriguing, and the plateau outside, as well as fantasies characteristics, heels transparent and original shapes such as those with open heel. The line of boots tip of overknees with heel or wedge, from the upper often in bicolor and also in this case we can find the sculptural heels plexiglass especially in association with peaks cap-toe. There is no shortage of models sandals evening from variations in cage red stiletto heel, the sandals with color block lists in different colors and tip peep-toe. In short, a collection to be discovered, do not you agree, too?